David Janssen: Our Conversations (The Early Years) shares the ups and downs Janssen experienced largely due to the women who were part of his life. We see him growing tired yet the consummate professional and workaholic rarely took time to rejuvenate himself. During the divorce proceedings from his first wife, Ellie, it was costing him a fortune and he often claimed to keep busy because he needed the money; I feel it was a ruse he, sometimes, used to cover up his desire to please his fans. He knew his fans wanted more of him and he wanted to give it – not to mention that Janssen couldn't sit idle for long. He had to keep himself occupied with something and working kept his mind away from his troubles for a while. Reading The Early Years, I could see how the tabloids added fuel to a growing fire; it reminded me of my trips to supermarkets on various occasions. While standing in line at cash registers, I've often caught glimpses of cover photos with their various headlines and captions. I remember wondering how various stars felt having their lives so publicly displayed; knowing most of it was sensationalism – articles written just to make a few dollars – left a sour taste in my mouth. Personally, it would be a struggle if every move I made was documented even in a positive light; I couldn't imagine how I would feel if there were lies printed about me, people speculating about this or that when, in my mind, they should have better things to do with their lives. Regardless, sensationalism sells and, sadly, it doesn't matter what the consequences are to people and their families. David Janssen was such a star who fell victim to people believing things just because they read a story or article in a paper or magazine; he stressed to Phelps the importance of not believing everything he read and heard, that things were not always as they seemed. Sometimes, however, Janssen used what was printed in the tabloids to his advantage. Admittedly, in 2013, when Phelps first mentioned the late David Janssen to me, his name wasn't familiar. Even so, as the friendship between Phelps and I grew, I became curious about this person whom he thought so highly of, whom he dedicated so much time to in terms of endeavoring to write about the real man when the camera was out of sight. I checked Janssen out by watching a few episodes of The Fugitive – and was riveted to the screen. Watching him became so highly addictive that I only watch him on select occasions when I give myself permission to sit in front of the television for three or four hours at a stretch – a rare occurrence. Reading David Janssen: Our Conversations (The Early Years), I would soon learn that Janssen lived for the various roles he assumed and thrived on pleasing his fans. However, it came at a high price – working most of the time with little downtime, especially when starring in a television series. Even though he loved being in front of the camera – loved to give his fans something new to watch – it seemed his life began to spiral out of control as his popularity increased. After reading about the early years of his friendship with Phelps, I grew to care about David Janssen – not just as a good looking, popular star but as a person with thoughts and feelings, a person with hopes and dreams. Sometimes I wish I could have met him - even wonder, at times, if I might have become another pair of listening ears. It can never come to pass but I can't say how privileged I feel to have been able to listen in to these conversations. Though there is little physical action demonstrated during the conversations between Phelps and Janssen – in terms of whether they moved a hand to wipe a crumb from the table, stretched, stood to greet a friend, yawned or wiped a tear from an eye – the words themselves carry the story. You will likely notice as I have that, though we learn about Janssen's life and some of his innermost thoughts, we also learn about Phelps and some of the things going on in his own life. Despite the differences in their backgrounds, we can easily understand why the two became, and remained, friends. In a non-fiction book of this nature, it is wonderful getting to know the author who brought such a work to life. If you would like to read the various ratings or learn more about Janssen behind the scenes, please take a few moments to check out David Janssen: Our Conversations (The Early Years) page on Amazon. 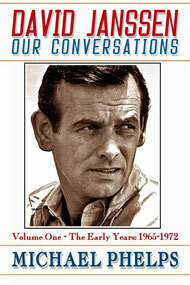 Stay tuned for my review of part two, David Janssen: Our Conversations (The Final Years).